Corfe Bears > Charlie Bears > MINIMO MAVIS 7"
View other bears from Minimo Collection - In Stock Now. She is part of the "PUDDLE'S PAMPER GIRLS" SERIES, which also includes MAUDE and MILDRED. MAVIS MINIMO is one of the bears in a brand new mini series called "Puddle's Pamper Girls" and these girlie bears are beauticians who work in a Beary Beauty Spa called Puddle's Pamper Parlour and they can give the bears lots of treatments, including paw-dicures and claw extensions!! The set consists of small mohair bears and the attention to detail on them is amazing! MAVIS is made from a curly moss green mohair, that has some light tipping and this is fairly sparse, as you can see the warmer backing material showing through and she has a tuft of long cream fur by her neck. The ears and paw pads are a short-pile mohair in light brown and she has sparkling black eyes, a brown hand-stitched nose and mouth and stitched claws. She wears a pretty black frayed ribbon around her head that is tied in a bow at the front and is accessorised with a butterfly and scissor pendant on a knotted cord. At only 7" in size, there will definitely be room in your collection for one.... or all of them!! 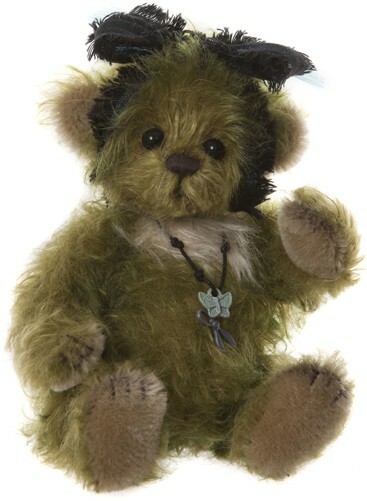 Mavis Minimo is a fully-jointed, miniature mohair bear from the Charlie Bears 2019 Minimo Collection. Each Minimo comes in an embroidered drawstring bag. This is a collectors item and not suitable for under 14 years of age. 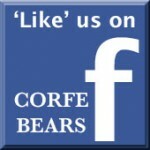 © This description has been written by Hayley Maskell of Corfe Bears and is our intellectual copyright. If used by any other party, further action will be taken.